Kice has been in the dilute phase of pneumatic conveying for over 50 years and has covered a number of materials. This includes wheat flour, corn meal, soy meal, whole grains, spices, wood products from chips to flour, plastics from virgin pellets to regrind, meat by-products and many more commodities. Obviously different products require different types of conveying. Many materials can be conveyed in positive pressure lines while some products require vacuum conveying. 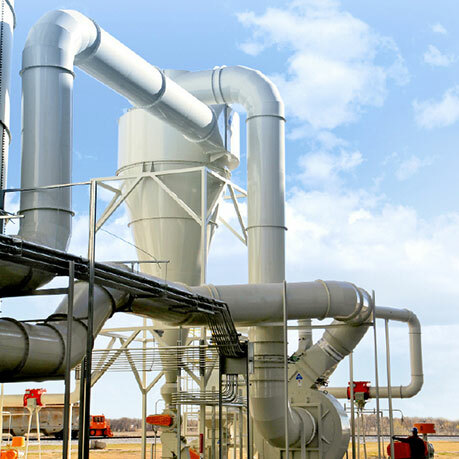 Normally pneumatic conveying is used simply to transport a material from a pickup point to a destination while at other times products may require a given amount of conveying air to cool the product, keep hammermill screens clean, or maybe convey aspirated products to a destination. You will find that pneumatic conveying is extremely versatile for moving a product through your plant. The most efficient and simple method of pneumatic conveying is using a positive pressure system. To simply convey a product from point A to point B generally requires a positive pressure blower package, rotary airlock, a cyclone receiver (sometimes an airlock valve) and the tubing system with elbows, sight glasses and couplings. Normally the exhaust air from the cyclone receiver will need to vent to a secondary filter, scrubber, or simply atmosphere. 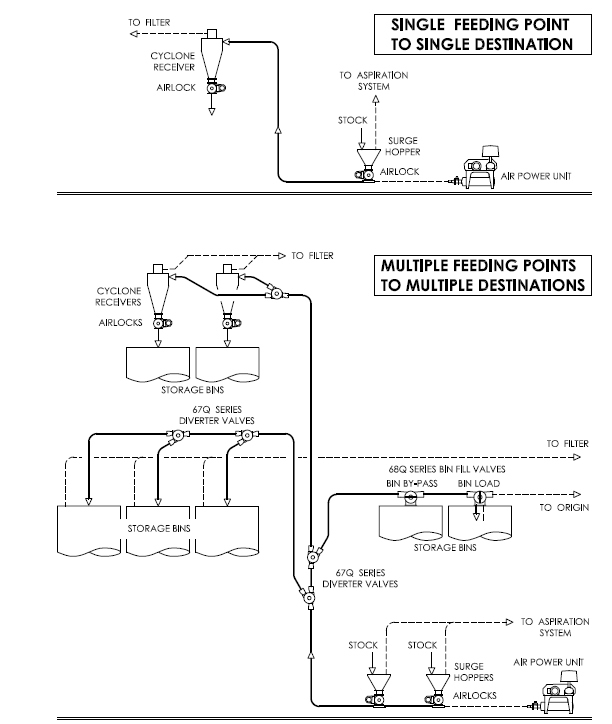 One of the features of a positive pressure system is that you can add pickup points and go to multiple destinations. Simply add in line diverter valves to the conveying line and pick any one of a number of destinations. There is various methods of discharging to a number of destinations. Another feature of positive pressure conveying is that with planning and engineering you can actually loop a system and reuse the same air to convey the product to a second destination in series. This is not always recommended and requires special design. Normally positive pressure systems use PD (positive displacement) or constant displacement blowers. Generally these blowers are rated to 15psig although a few may be rated lower or higher. Seldom do we at Kice design systems to work at pressures greater than 10psig. The major reasons for this are dependability, heat considerations, stress on couplings and component equipment. Most systems run 24 hours a day and many 7 days a week. This places considerable stress on a relatively small piece of equipment with high input horsepower. Also, if the system is designed to the max there is nowhere to go if you need to increase the conveying distance or capacity. There are numerous variations and combinations of vacuum, pressure, and vacuum/pressure conveying systems. We at Kice would welcome a chance to visit and work with you on your requirements. If you have any questions please do not hesitate to contact us and one of our project designers will be happy to discuss your requirements with you. The second popular method of conveying is by vacuum. There are a number of reasons for vacuum conveying. One of the first considerations is that it is considered more sanitary. There is no by pass air from the feed in airlock or leaks in the piping system. Often the conveying air is also used to cool the product and help the efficiency of a grinder or extruder. Generally speaking the vacuum system is not as efficient from horsepower or air volume requirements as a positive pressure system but the benefits mentioned often offset this disadvantage. Generally speaking, vacuum conveying systems use centrifugal fans that normally work in vacuum ranges of 20“wg to 40“wg. This means the air system will be considerably larger than a positive pressure blower system working in the 4-9 psig pressure range. When using centrifugal fans, cyclone receivers are sufficient from a clean air point of view. Sometimes the positive displacement blower will be used for the vacuum air mover. This type of system will work in inches of mercury “HG” and normally ranges from 6“hg to 12“hg. The deeper vacuum allows much higher capacities over the centrifugal fan for a given line size. This system is often used for conveying away from rail cars where clearance under the car is minimum and capacity is critical. The disadvantage to this system is that the PD blower can only digest very small amounts of dust so a filter receiver is normally required rather than a cyclone receiver.